A tip for adding non-structural pizazz to your ceilings. 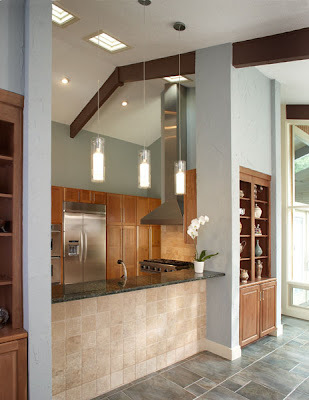 Kitchen Design Notes: Ceilings Need Attention Too. 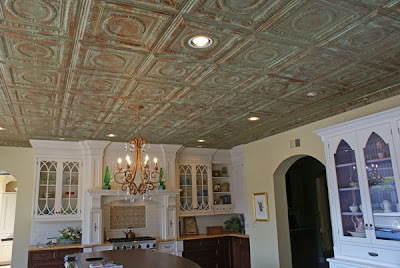 In posting my topic on ceilings, it turns out there is more to be said, and Kelly over at Kitchen Sync blog has offered some fine tips on ceilings. A valuable discussion Kelly, thank you. 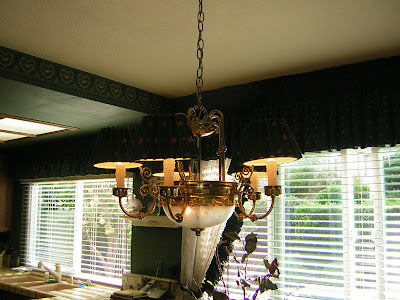 Many times the ceiling is the overlooked surface in kitchen remodeling. Here are some lovely examples of designing with the 5th “wall” in mind. 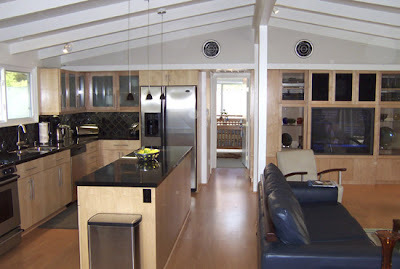 If you are graced with 10′ plus ceilings, there are more options available. But, if you live in a two story home with standard 8′ ceilings, take heart, there are still options available for you. 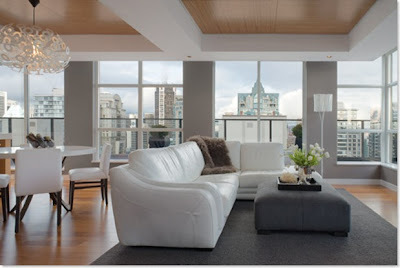 This space designed by one of my favorite designers, Patricia Gray, shows off a floating ceiling. What a fabulous technique. Another view into the work of Patricia Gray. 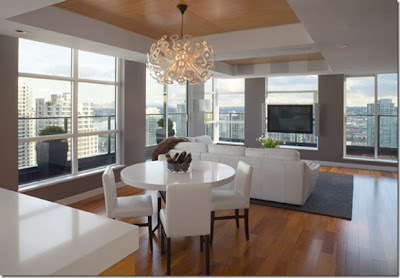 The wood tones adds warmth to the otherwise glistening reflective space with nearly floor to ceiling spans of windows. In this rambling California Ranch with cathedral ceilings, rough hewn beams (the very top left of the photo), were added to ceilings. 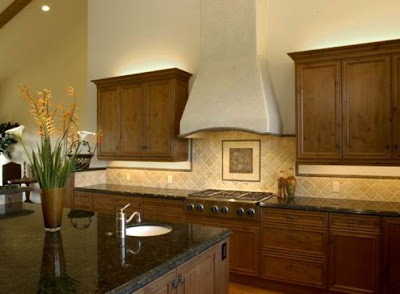 Additional accent lighting above the cabinets sends the accent lighting upwards. The focus directs your attention up. A two story home, although the ceilings are standard height, this vintage inspired kitchen plays up the molding detail, wrapping around the angled details. This kitchen, designed by my associate, Liz Tiffen, will be on the Tour of Kitchens, October 19th. For tickets and more information about the Tour please visit http://www.NKBAccv.org. 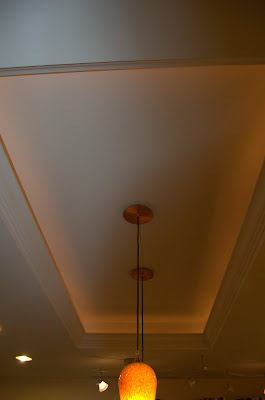 For many of us who have had the 1970’s recessed 4 x 8 fluorescent light tubes covered with plastic panels, an interesting update to the ceiling is the use of coved drywall finished with crown molding accenting the inside perimeter. Additional recessed can lights can be run inside this recessed area or as shown here, pendant lights and accent lighting behind the molding. In Southern California, our older Spanish style homes, Art Deco or Craftsman style homes built in the 20’s and 30’s had great detail included: coved, art deco tray or beamed ceilings . If you are lucky to have a home with good bone structure to start with, lucky you. 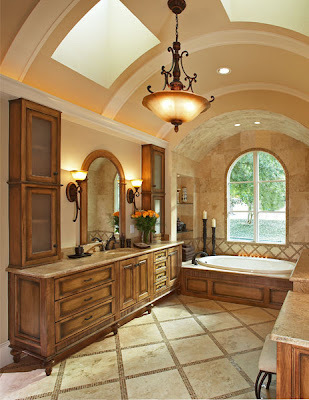 If not, there are so many lovely styles to select from, it’s a shame to neglect the ceiling. Here are some more examples of great ceilings. A barrel ceiling by Capital Improvements, in Dallas Texas. (In Texas where they really do everything big). From the Vaughn Group, Dallas, Texas. From the Traver Group, Texas. And of course, I cannot end this series of ceiling details without showing the lovely, over the top (literally) faux painted sky ceiling. This one feels like a trellis above with the vines trailing down onto the wall. This one is just faux you. I have been holding onto this photo forever. I think the kitchen is charming. This is from YesterTec. 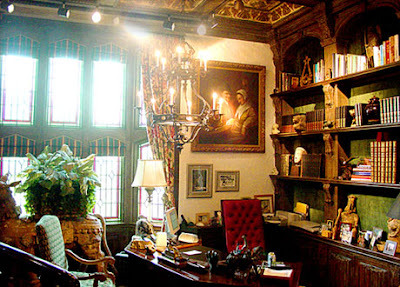 A furniture company that specializes in amazing workstations hidden in armoire designed furniture. 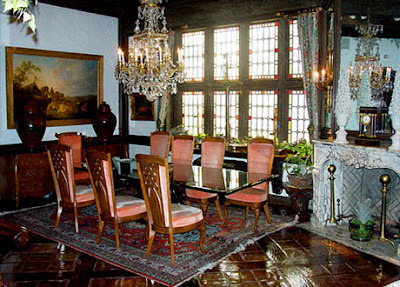 Thursday afternoon I was invited to tour the Enkeboll Castle in Carson, California. The Enkeboll Company, founded by Raymond Enkeboll, produces legendary wood carved architectural products. Getting to tour the facilities where some of the most beautiful carved wood products are made was worth clearing my calendar for the day. I felt like a kid getting to go behind the mysterious gates of Mr. Willy Wonka’s Chocolate Factory. Fascinating. It has that same sense of mystery, anticipation and excitement. I was waiting to see if the Oompa Loompas would appear. Upon entering the wrought iron garden gates, a stone and brick pathway gently winds its way to the hand carved front doors of this authentic styled Tudor Castle. The front of the castle is truly special. From the floors to the hand carved beams in the ceiling. Security was very serious. I have been sworn to secrecy not to reveal anything. Cameras were not allowed. These photos are courtesy from the Enkeboll web site. I toured the front offices, the showroom, the factory floor and the Master Carver’s wood shop. I wish I could show you photos of the employee kitchen. Let me just say, these folks are soooo happy to work here. Many have been with Enkeboll from 15 to 25 years. They are a lovely group of people. They treated us like family, so proud to show us around, and so helpful and really offering their help with future projects. I received first class service. Our tour guide, Felipe, who began his career with Enkeboll over twenty years ago as the lowest man on the totem pole; now runs the show as plant manager. He showed us the inner workings of the plant, and remember I am sworn to secrecy not to reveal trade secrets. So to keep “Willy Wonka’s Slugworth” at bay, sorry, but mums the word about the plant. Upon completion of the tour, one of the highlights was getting to meet highly acclaimed, accomplished kitchen and bath designer and our guest speaker, Ellen Cheever, CMKBD. I have admired her work and contributions to our industry for a very long time. I considered her an industry giant and I have to admit, I was a little bit intimidated to talk with her. And so when she personally reached out to greet everyone who came, I was so impressed with her graciousness and wonderful kind spirit. We were treated to an interactive creative design session learning to use molding in new ways. Mrs. Cheever was helpful in showing her own design mistakes with molding and tricks to avoid making them. We then formed into small think tank groups. We had the run of the molding showroom, coming up with new ways to use these amazing moldings. A designer’s candy store at our disposal. It was fabulous! But wait, it gets better, I was able to work with the Master Carver, who created the Vineyard series. I learned how to correct a molding piece that was installed wrong. I learned the proper way to sand and hold carving tools. He was so patient, making sure I did not impale myself with his carving tools. Such a doll! And so to end our day, back to the castle, we drank wine and delectable appetizers, and yes, there was chocolate! My very own Willy Wonka experience come true. However, there were no Oompa Loompas, (at least not during the day), and fortunately, unlike Willy Wonka’s Golden Ticket tour, nobody in our group fell in the chocolate river, or got sucked into a tube, or turned blue, or sent down the garbage chute, or miniaturized. We did make new friends, chatted with other kitchen designers from Los Angeles and had an all together wonderful time. So thanks to John Pujol, President of Enkeboll, for opening your doors to us, and thanks to his wonderful staff and to Omega Cabinetry for giving us a golden ticket of an experience that I will never forget. 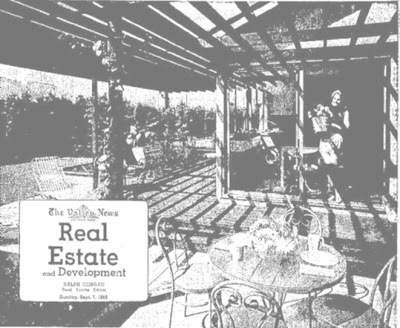 The L.A.Times Real Estate Section had a feature on The Ranch, Refined. The countryside is ever-present in Pali’s free-flowing plan. Here, the living area naturally leads to the open kitchen. 14 ft ceilings, clerestory windows, wide open passage ways from one room to the next are my favorite features. 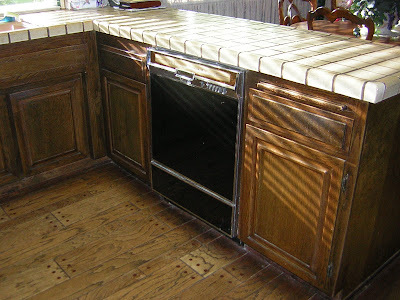 The challenge of a Ranch Style kitchen. 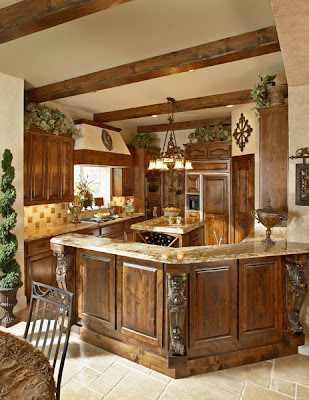 The challenge for many who are ready to update the ranch: keep budgetary costs down with minimal structural and mechanical changes while improving the layout of the kitchen. 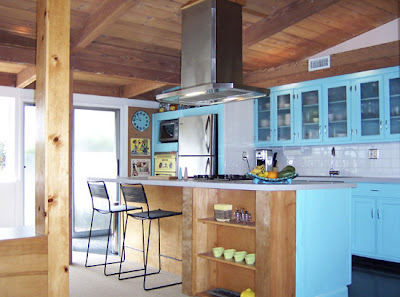 Here are some ideas from my own collection of jobs and from around the net that show small space Ranch Kitchens with maximum impact. A new ranch style home for sale. In California, ranch home subdivisions exploded like wild poppies all over the state in the 1960’s and 70’s. Some better than others. Big lots, huge backyards, massive windows and sliding glass doors welcomed indoor/outdoor living, vaulted ceilings, 2 car attached garages, walk-in closets, spacious formal dining room, living room and den to boot. The Klawitter Home in Long Beach, CA. 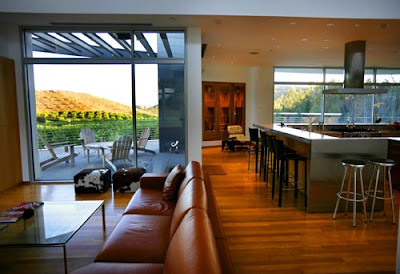 An example of the best part of California Ranch House style: The indoor/outdoor living. Ironically, the kitchens in these big, beautiful ranch homes usually shared the same impossible U-shaped footprint or narrow galley kitchens. 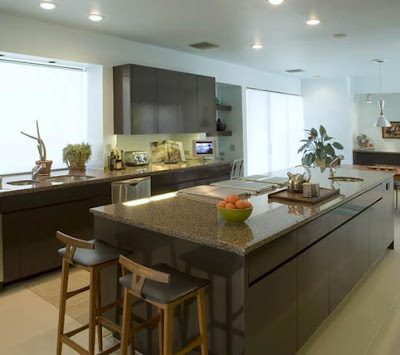 Peninsulas with blind storage corners, massive sink base cabinets centered over a pass-thru kitchen window intended for ease of entertaining and serving to the patio. Before: Clerestory windows. Vaulted Ceilings. Views of the backyard make for a good beginning. Goal for the new kitchen: Improve the layout, add counter space. After: continue the clerestory windows into the kitchen allows the light to flood the kitchen. Before: Three entries into the kitchen makes for an awkward layout with small counter space, small pantry and limited space for appliances and storage. After: Third doorway closed off allows for bigger range and powerful vent hood, microwave and warming drawer allows the cook more flexibility for cooking large meals and entertaining. More counter space, open airy space with new half wall into dining room. kitchen and make it look smaller. to bounce off reflective surfaces. After: Additional counter space and an easy place for guests to relax with you in the kitchen. Customized storage makes cooking easy. The storage in this kitchen was doubled with customized features. Accessible and Durable Storage: Lighted corner cabinets. Heavy duty hinges. An 1965 newspaper ad. The Valley News, San Fernando Valley, CA . 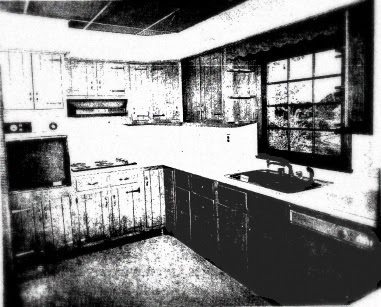 A 1970’s Raised Ranch with it’s original kitchen layout. Cabinets with impossible storage corners. The peninsula and large spans of windows prevents needed wall cabinet storage. 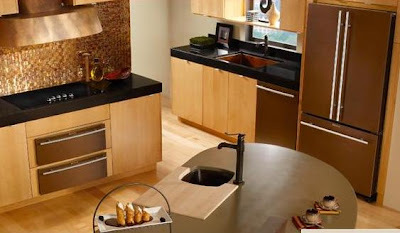 During the remodel: the peninsula with the blind corner banished allows for the sink wall to be outfitted with a giant lazy susan corner and a trash base to the left of the sink. The new position of the dishwasher is given a proper home to the right of the sink, followed with drawers to the right for cutlery. 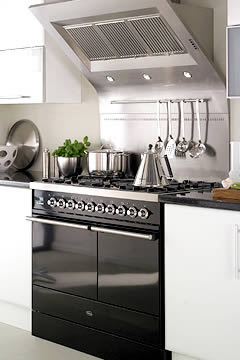 The cook top location remains at the same location but gets a boost of cooking power with an under cabinet oven. 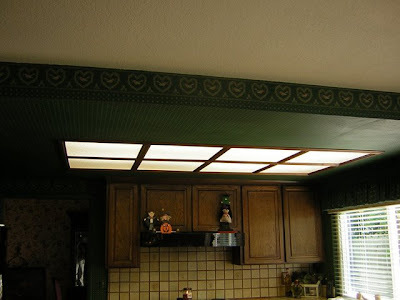 The old kitchens with the typical 70’s dropped fluorescent oak trimmed light fixture. The new hood becomes the focal point. No space for a double oven? If it’s been a while since you shopped for a range, the new double oven range offers unequaled versatility in one convenient package. 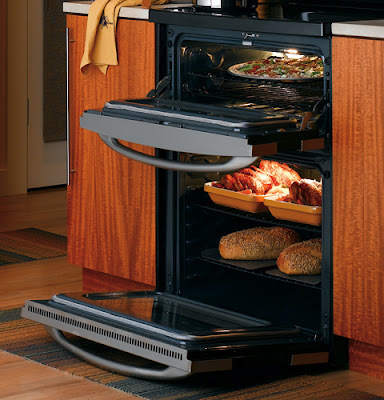 Introducing GE’s hottest new innovation in cooking convenience! This new GE Profile™ double oven range allows you to cook two different dishes at two different temperatures at the same time. 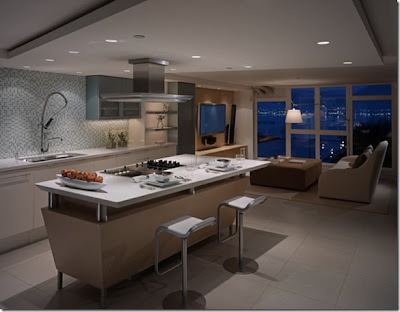 The stunning kitchens below are from http://www.bauerdesign.com. Here, a U shape Kitchen with functional storage in every usable inch! 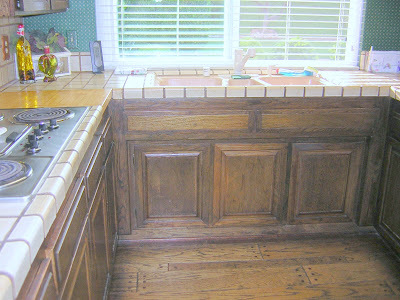 This mahogony stained kitchen is fabulous. 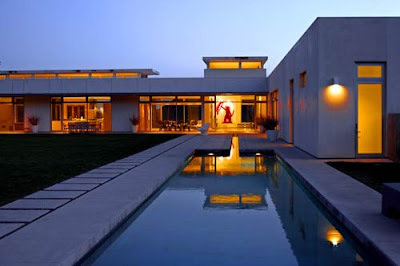 Rancho Style: Modernism Meets the Ranch House. I am a huge fan of the Cliff May homes. 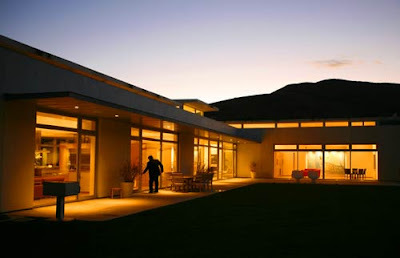 They were certainly inspired by the Western ranch house, but they are unique in their modern interpretation of this California design. The Long Beach Cliff May’s were built in the early 1950s and reflect the modernist influences of the time with open floor plans, exposed post-and-beam ceilings, clerestory windows and floor to ceiling glass. Many Cliff May designs are L- or U-shaped and are positioned to the back of their lots, a design layout which he envisioned would provide for more open outdoor space and an enhanced relationship between the homes’ interior and yard. 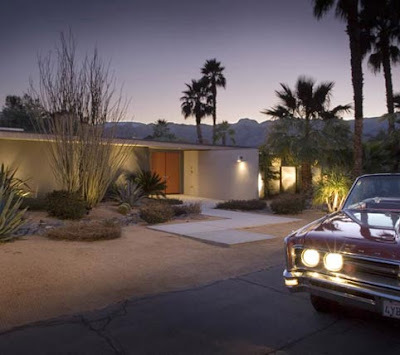 As more people become interested in design—whether it‘s a toaster or an automobile—more are wanting their homes to reflect what they value. These individuals tend to share a common aesthetic and appreciation for form and function. They are, in large part, the new breed of owners who are shaping the future of neighborhoods such as the Ranchos. And somewhere in the great beyond, Cliff May is undoubtedly cheering them on. 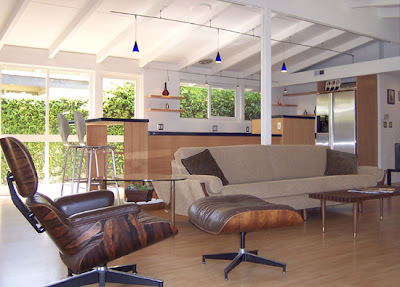 The Eichler Home: Distinctively different from the Ranch Home, the Eichler shares the same beauty of indoor/outdoor living with Atrium courtyards. 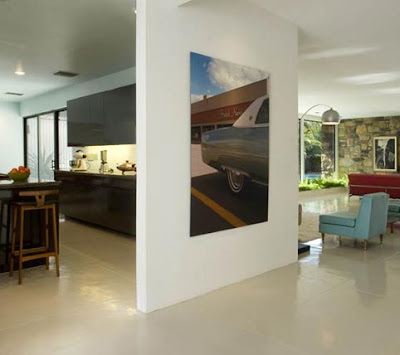 A midcentury modern home built by developer Joseph Eichler and his Eichler Homes, Inc. built nearly 11,000 single-family homes in California, beginning in the late 1940s. In Northern California, they can be found in areas in and around Marin county, the East Bay, San Mateo county, Palo Alto, Sunnyvale, San Jose, San Francisco, and Sacramento. Three small communities of Eichlers in Southern California stand in Orange, Thousand Oaks, and Granada Hills. 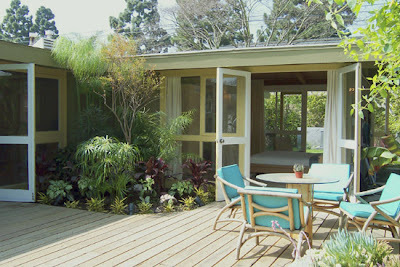 In addition, there are three Eichler-built residences in New York state. 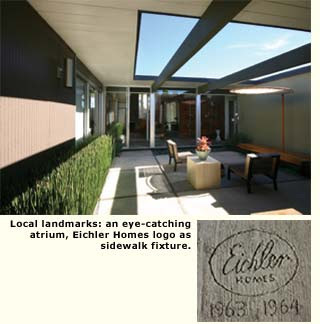 Together these thousands of “Eichlers” reflect the beauty and uniqueness of the Eichler design and the integrity and daring of the builder behind it. Fifty years later, the house that Joe built endures as a marvelous legacy. Have we gone so neutral that we are starved for color? Kitchens never have to be bland. Ok, so the ranges above are a bit wild and may not sell in Iowa, but the point is we have freedom of choice to add color where ever we want in appliances, paint on the walls, choice of artwork, tile splashes, textures and colors for counters, cabinets and hardware means that you can personalize your kitchen with color in any form you desire. Me? Color me happy with anything other than white walls. I tend to shudder when clients want white walls and white ceilings. Give me white appliances, white cabinets and white sinks, but I would really rather eat paste than paint my walls white. Wild pattern on appliances , I am not so inclined to take the plunge preferring muted color pallets instead, but colored LED lighting my water is groovy! Here is what is going on in the world of design: Over at Design Undercover, the talk is about Cookers in Britain (that’s a “range” to you and me in America), coloring up in new shades. The Cooker as Couture? Inspired from the Catwalks of London, Paris and Milan to Britannia’s new line of Couture Ranges. Leave it to the Europeans. Ooh, la, la! Over at Trendir the news is on Italian new colored Temperautra Colorata Faucet by Guglielmi. 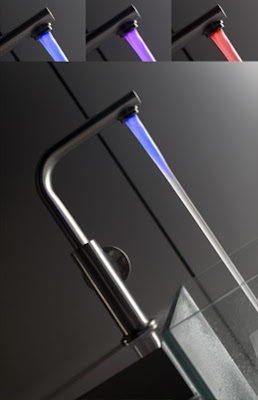 Within this modern form, the Guglielmi Kitchen faucet features an integrated LED light which reveals the water’s temperature through the use of color. Cool water appears brilliant blue, warm water a vibrant violet, while hot is a fiery red. A wonderful faucet for children, the simple use of color adds both a safety feature and a modern glamour. A clever and dynamic design, the Temperatura Colorata faucet by Guglielmi uses LED technology to create an innovative kitchen fixture. Back in the States: the statement in color for 2007 is more subdued: The newest colors introduced this year: Jenn-Air introduced Oiled Bronze appliances at the 2007 Kitchen and Bath Show. 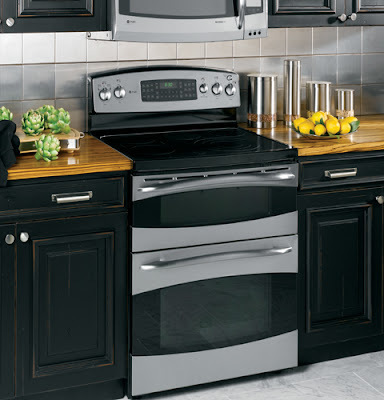 Jenn-Air combines the traditionalism of bronze sculpture with the polished look of stainless steel accents to create a unique, enduring Oiled Bronze finish for kitchen appliances. The depth of bronze hues, coupled with the stainless steel handles and hardware, allows the Oiled Bronze kitchen suite to balance with other design features in the kitchen. This versatility allows consumers to outfit a full kitchen of Oiled Bronze appliances or add an Oiled Bronze offering to soften kitchens with stainless steel or black appliances. 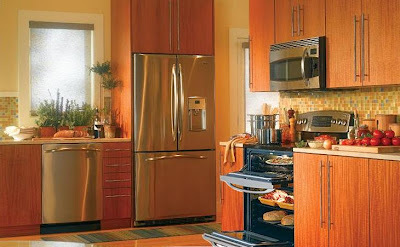 The Oiled Bronze finish is available on refrigerators, dishwashers, wall ovens, cook tops and hoods. Perlick also introduced Amethyst and Copper into their line up of under counter refrigeration systems. Amethyst? Yes, This isn’t the first appearance of tints and shades from the purple family of colors. We’ve seen AGA’s Aubergine and Heather and Caesarstone’s Mulberry Mist. 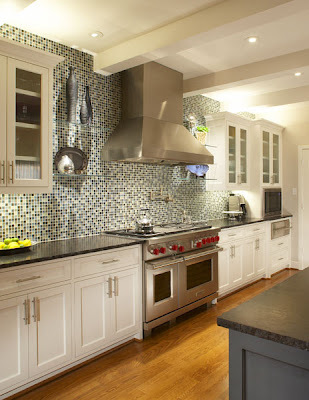 Not sure how to integrate color into your kitchen? Take a look at these sources for some additional help. Dunn Edwards offers a Palette Previewer that lets you upload photos of your room and try out a multitude of color combinations on the walls and trim moldings. Fabulous! Download Benjamin Moore’s Ensemble Winter 2007 catalog for inspiring room combinations. Oh God, here we go again, more products to watch out for. 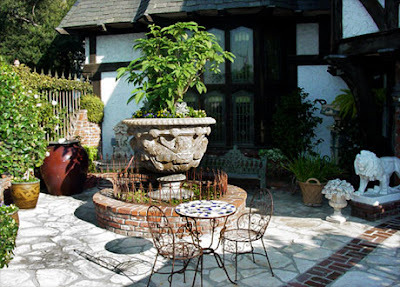 Please click on the link above to follow the link to LA Times: Pardon Our Dust: Southern Calif. Remodeling Tales by Kathy Price. Even my beloved Pier 1 Import store has a recall listed in the updates. Sorry to be the bearer of gloom and doom. Bookmark this link and check in at least once a month to see what else turns up. US Consumer Product Safety Commission.